0800 255­ 426 We’re here to talk 7 days a week! Cover for the treatment costs for Veterinary Fees attributed to accidents, injuries or illnesses which may happen to your pet, providing they occurred after taken out insurance with Petplan. There is a 21 day waiting on the treatment of any illness. I.e. any illness that occurs within the first 21 days of cover is excluded, but accidents are covered immediately when cover is taken out. Can I cancel my insurance policy over the phone? To protect all parties concerned, we must have all cancellation requests in writing. This can be done by email or fax. You are able to cancel your policy at any time. Any policy that is cancelled during the 21 days cooling-off period will be refunded any premiums paid since the commencement of the cover. Does Petplan cover the costs of my pet’s vaccinations or desexing? Petplan provides peace of mind that your pet will have access to the very best veterinary attention should an unexpected injury or illness happen, that you otherwise would not be able to budget for. Routine, preventative or elective care of your pet, such as vaccination, worming and de-sexing can be budgeted for. This is similar to how your car insurance generally does not cover routine service, tyre care or registration fees. Am I covered if my dog bites someone or causes an accident? Is Third Party Liability included? Petplan dog policies cover Third Party Liability damage up to $1 million, $3 million or $5 million depending on your selected plan. Third Party Liability covers any injury or damage caused by an insured dog, that the owner may be liable for. Will you continue to renew my pet's insurance when he/she becomes old? Petplan does offer cover for the life of your pet your pet remains covered as long as you continue to renew the policy every year. On Petplan’s genuine “Covered for Life” insurance policies, cover can start from 8 weeks of age and must be before their 8th birthday and if your dog is a select breed the insurance must begin before their 5th birthday. Once on cover, we will continue to cover them right through until either you cancel the cover or your pet passes on. While the age of your pet does affect the number of claims we pay (Pets over 10 yrs are more likely to have claims) we will strive to ensure our premiums not unfair or unrealistic. I am going on holidays will my dog be covered if I take it interstate with me? Yes Petplan will cover pet anywhere within New Zealand and for up to 30 days whilst in New Zealand. Will my pet be covered for paralysis ticks? Yes, Petplan cover the treatment of paralysis tick treatment, and it is not limited to a set amount or number of incidents per year. If my Pet needs physiotherapy will that be covered? YES Petplan covers alternative treatments and therapies and we are also the only Pet Insurance Company that covers treatment for behavioural issue. Will you cover the costs of cancer treatment? Yes we will cover the costs of the treatment of cancer such as chemotherapy*. Would you cover the costs if my pet was to get parvo or kennel cough? We will cover for illnesses for which a vaccine is available i.e., kennel cough, parvo virus, herpes virus or lepto, providing your pet has been vaccinated and the vaccination is current. Does Petplan cover for congenital and hereditary conditions? Yes Petplan will cover the costs of hereditary and congenital disorders as long as the pet has not shown clinical signs of the condition prior to cover commencing or within the 21 day waiting period. If my pet was to suffer an ongoing condition or lifelong condition such as diabetes or epilepsy would it be covered for the life of the pet, or would I only be able to claim for the condition during the first year of cover? Petplan Australasia has ‘Covered For Life®’ Insurance for the life of your pet, providing the cover is renewed each year without a break. The number of times you can claim for the same illness in fact is unlimited; enabling you to give your animal the very best in veterinary care regardless of how much it costs. However, the amount for which you can claim in any one year is capped on an annual basis to the maximum benefit amount stated in your policy and a fixed excess fee will apply to any claims made. On Petplan Covered For Life® pet insurance the excess is payable per unrelated condition (Illness), per policy year. Remember, with a 'Covered For Life®' policy, you get what you pay for - a comprehensive policy that will cover your pet’s conditions for life! 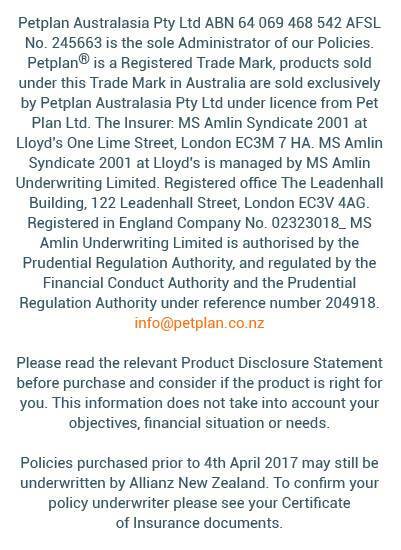 Petplan is the only Pet Insurer in New Zealand offering “Covered For Life®” policies*. *Correct at the time of publication. Are there any sub-limits on your policies? Petplan does not apply sub-limits for veterinary treatment of any illness or injury on any of our policies. However, amounts paid under Death, or Alternative and Complementary Treatment benefits like Acupuncture, Homeopathy, Chiropractic Manipulation, Physiotherapy and Hydrotherapy are subject to the maximum benefit of your selected plan. If my dog is already sick or has been injured will you cover the treatment if I take out a policy today?